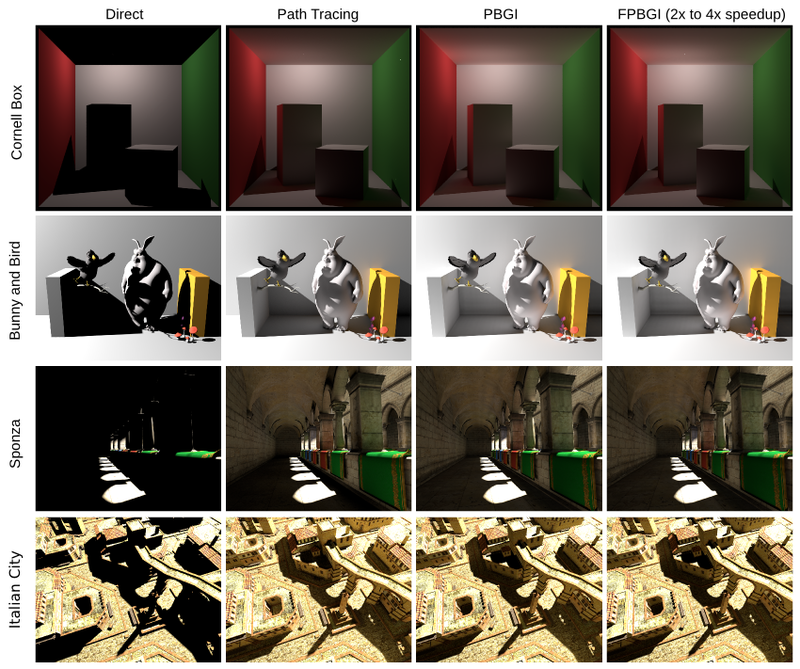 The Point-Based Global Illumination (PBGI) algorithm is composed of two major steps: a caching step and a multiview rasterization step. At caching time, a dense point-sampling of the scene is shaded and organized in a spatial hierarchy, with internal nodes approximating the radiance of their subtrees using spherical harmonics. At rasterization time, a microbuffer is instantiated at the unprojected position of each image pixel (receiver). Then, a view-adaptive level-of-detail of the scene is extracted in the form of a tree cut and rasterized in the receiver's microbuffer, solving for visibility using a local variant of the z-buffer. Finally, the pixel color is computed by convolving its filled microbuffer with the surface BRDF. This noise-free indirect lighting method is widely used in the industry and captures several critical lighting effects, including ambient occlusion, color bleeding, (indirect) soft-shadows and environment lighting. However, we observe a large redundancy in this algorithm, both in cuts and receivers'microbuffers, which stems from their relatively low resolution. In this paper, we propose an evolution of PBGI which exploits spatial coherence to reduce these redundant computations. Starting from a similarity-based variational clustering of the receivers, we compute a single tree cut and rasterize a single microbuffer for each cluster. This per-cluster microbuffer provides a faithful approximation of the incident radiance for distant nodes and is composited over a receiver-specific microbuffer rasterizing only the closest nodes of the cluster's cut. This factorized approach is easy to integrate in any existing PBGI implementation and offers a significant rendering speed-up for a negligible and controllable approximation error.